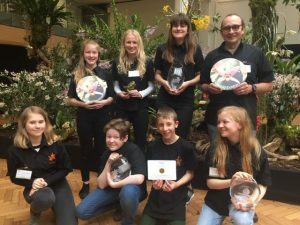 The awards have been distributed and the orchid project has won both top prizes – Best Display and Best Specimen Plant for Dendrobium delicatum. Today’s team have been fantastic and very, very busy. The lab has been very successful, thousands of people have been asking questions about our plants and our project, and the sales table has been busy all day. Thanks to the adult volunteers for their wonderful effort both to get students to London and for helping on the stand. I am really proud of the whole team. Wow so many awards,that’s brilliant. Just shows what a fantastic team you are.